TMZ reports that bartering isn't just for budget conscious ballers anymore. 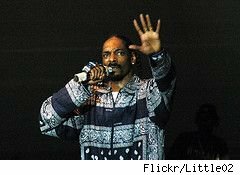 During a late night run for food, Snoop Dogg and Stephen Marley traded concert tickets, T-shirts and hats for 6 pounds of ribs, hot wings and several pizzas. It's rumored that as they pulled away a worker heard an impromptu remix of Snoop's Ain't Nohin But a G Thang echo down the street. For the $900 worth of pizza and sides, workers at Big Louie's Pizzeria in Eureka, CA, scored 12 concert tickets, presumably to one of the upcoming Blazed & Confused concerts taking place in Cali later this month. If so it's likely that the workers made out as good as Snoop and Marley in the deal since VIP tickets to the show start at $156 that could put the total value to employees close to $2,000. For Snoop's part, the cost is more than likely nothing since he has easy access to tickets to his shows. While you may not score tickets to one of the most well known rappers alive, bartering is easy to do and more people are starting open to exchanging goods and services it which translates into a wealth of opportunities for you. Why not try asking the next time you need something from a small business?